Visible crew/equipment: When 'Hannah' and Lilly walk into Rob Reiner's office, the multiple head studio lights are reflected on Hannah's large black sunglasses. Continuity mistake: At the end of the episode, the Stewart's neighbour comes in their house and takes their pot of candy. In the next shot when Robbie and Jackson are talking, the pot is back on the table. Visible crew/equipment: When Miley leaves to buy a pretzel, you can see a cameraman as she gets up and leaves the theatre. Revealing mistake: When Roxy carries Robbie on her back up the stairs, you can tell that she has a dummy on her back (just look at his feet). Continuity mistake: As Miley talks to Lily on the beach about what Jackson said about liking her - Miley's bag falls from her shoulder and is then in her hand, but is then on her shoulder again - and goes back and forth during the scene. Continuity mistake: After Lilly puts on the lip gloss and her lips go numb, in the shot facing her she is holding the lip gloss in her right hand, but next shot facing Miley the lip gloss has vanished from her now open hand. Continuity mistake: After Maddie tells Robbie Ray that her mother will be happy to learn he's alive, Miley tells her to take some of the happy and put it over by the suitcase, at which point we see the suitcase is zipped up, but in previous and following shots it's unzipped. 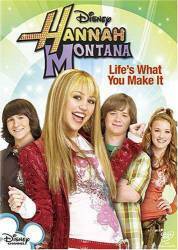 Continuity mistake: When Miley is about to tell Oliver that she's Hannah Montana, her lips are really black. When it cuts back to her after Oliver asks "Why? ", her lips aren't black at all. Visible crew/equipment: While on the train for their class trip to Washington, just as Miley stands up before she elbows Oliver in the chest, the boom mic is visible at the top right of the screen, before it pulls up out of shot. Continuity mistake: In the beach scene, when Rico sets down his candy box on the bar, the label is turned towards the camera, but when the shot goes to Jackson and then back to Rico the label is turned away from the camera. Continuity mistake: When Miley and Robby Ray are at the table talking and eating the chocolate cake, the jar of jelly keeps moving on and off the napkin. 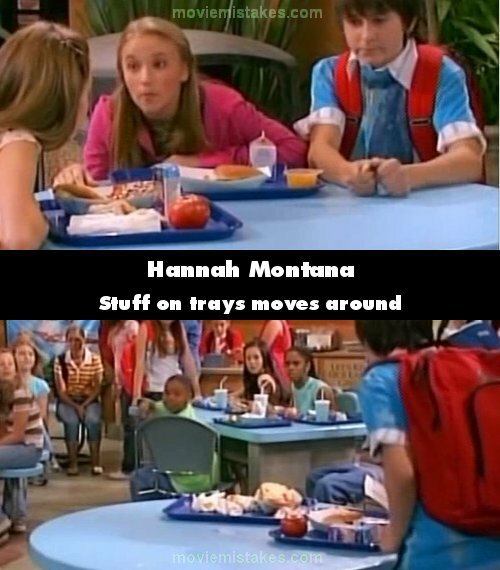 Continuity mistake: When the ketchup is on Miley's hand in the lunch room it disappears and reappears when she picks up her tray and also when Lilly puts the bracelet on Miley. Continuity mistake: Miley has to hide all of the newspapers under her sofa, because they have the bad Hannah headlines on them. We see a lot of the papers fall out from under the sofa, but when Lily comes in, the papers that fell on the floor are gone. Revealing mistake: As Miley is explaining to Roxy about the bully, Roxy decides to show them how she cuts the pineapple. When the camera cuts, the string that will pull the pineapple is visible. Continuity mistake: In the episode when Miley has to choose who to take to the tennis match with her, in the scene when the first caramel candy apple lands on Rico's head, the stick is facing backwards. When the second caramel candy apple land on his head, the first apple's stick is now facing forward.